Although most ulcers are caused by bacterial infection or the use of common painkilling drugs, the real damage is done by your own stomach – specifically by the acid your stomach produces. It’s strong stuff. If you spilled stomach acid on your skin, it could cause a chemical burn. The only place stomach acid belongs is in your stomach because the stomach has the ability to protect itself. The stomach, in essence, has a liner a mucosal layer of tissues – that resists the acid. 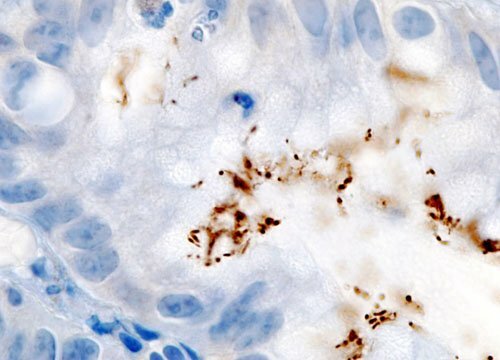 But a bacterial infection, such as one caused by the Helicobacter pylori bacteria, can eat away the lining and is thought to cause a vast majority of ulcers. Using too many nonsteroidal anti-inflammatory drugs (NSAIDs), such as aspirin and ibuprofen, also can break down the mucosal tissues. If that occurs in your stomach, you get a gastric ulcer. If it occurs in the duodenum, which is the small intestine just below your stomach, you get a duodenal ulcer. The corrosive stomach acid then creates lesions in the underlying muscle tissue. 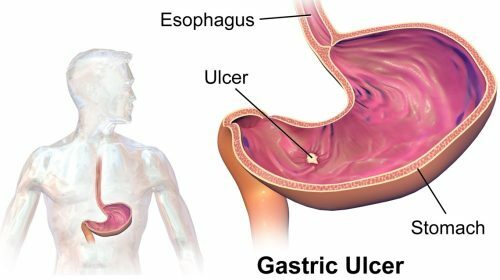 In the case of a perforated ulcer, the acid can actually burn a hole through the entire wall, so the stomach contents leak into the surrounding area. The typical ulcer symptoms are a burning, achy sensation in the mid-abdomen. The pain often happens on an empty stomach before meals or at bedtime. It might not occur before breakfast because that’s when stomach acid is lowest. And with some ulcers, there may not be any symptoms at all. If the cause of your ulcer is a bacterial infection, you’ll likely be treated with antibiotics to kill the bacteria. If it is caused by NSAIDs, you’ll need to look for other drug alternatives. You may also be given medications to suppress stomach acid. Tagamet or Zantac are two of the most popular over the counter acid suppressors. They aren’t a cure and should only be used to relieve symptoms and to enable the ulcer to heal. Typically, these treatments help the mucosal lining heal itself within 4 to 8 weeks. Ulcers can get more complicated and severe. You should immediately see a physician if you vomit blood or see blood in your stools, of if pain is persistent or severe and associated with abdominal tenderness, fever, or chills. Eat a little. It’s a quick fix, but ulcer pain can be relieved by eating. Food will quickly buffer the acid concentration in your stomach, but only for the short term. The trouble with food is that it also stimulates acid secretion, so within an hour or so, you’re back in the same situation. It can be a vicious cycle. Some people have said that they gain weight when their ulcer is acting up. They say that they have to go feed their ulcer. But if you need an immediate reprieve from the pain, this can help. Quaff some cabbage juice. Cabbage juice is high in glutamine, an amino acid that helps stomach cells regenerate. It also stimulates your body to produce a substance that actually protects the stomach lining. A good way to get glutamine is through drinking about a liter of fresh raw cabbage juice everyday. To make your own juice, it is suggested slicing then juicing or blending a green cabbage. You can also find glutamine supplements in most health food stores. Take the dosage recommended on the label. Mind the pain. No matter the site of the pain, you can always address the hurt to a degree, with medication and relaxation. Relaxation relieves pain by reducing the stimulation of the sympathetic nervous system, which goes into high gear whenever the body and mind are challenged. This is part of the whole fight or flight response. When your ulcer is hurting, you naturally have a fight response. Your muscles tense, blood pressure goes up, and your anxiety increases. It doesn’t matter how you achieve that relaxation. It could be through yoga, guided imagery, hypnosis, transcendental meditation, or a simple deep-breathing exercise. The point is that you use your mind to relax your body. Spare the spice. With nearly any kind of digestive problem, it is recommended avoiding spicy foods, acidic foods, and others that may cause you distress. It’s also a good idea to eat more fiber – grains, vegetables, and fruits. There is no standard diet, however for someone with an ulcer. If it bothers you don’t eat it. Listen to your stomach. No suds, no smokes. Heavy alcohol use can literally burn a hole in the stomach mucosal tissues. Even moderate drinking can aggravate the painful symptoms once you have an ulcer. Tobacco also affects the mucosal resistance of your stomach. Smokers have a higher rate of ulcers and recurrence whether it is the nicotine or tar in cigarettes that does the damage, but it’s apparent that the chemicals are absorbed through the lungs. These chemicals enter the circulation and then alter the mucosal barrier and acid secretion. Cut back on your drinking, or don’t drink at all. That goes for cigarettes too. Don’t smoke. Avoid the NSAIDs. This may not be easy to do if you’re taking nonsteroidal anti-inflammatory drugs to control severe arthritis pain. Still, check with your doctor because there may be alternative medications. If you’re self medicating, however, and taking over the counter NSAIDs, such as aspirin and ibuprofen for everyday aches, you should reevaluate why you’re taking those drugs in the first place. Maybe you’re taking one aspirin a day to protect against heart disease because you heard that’s a good idea. That’s usually okay. But sometimes, some ulcer problems in people taking only a small amount of NSAIDs – amounts that wouldn’t seem to be a problem. When you’re older, you can become much more sensitive to these medications. In the case of aspirin, you may be able to avoid the problem by taking entericcoated aspirin, which enables the medication to pass through your stomach before dissolving. Be aware, however, that not all damage done to the mucosal wall is by direct contact with NSAIDs, just absorbing the medications into your bloodstream can cause problems.